[FROM THE ARCHIVE] Helmut Lang Accessories Spring/Summer 2004 - Browsing through the Pinterest and always find a cool things over there, one of them just tonight I found this amazing dress shoes and very pointy but still have sense of masculine. What I see today and so many shoes featured a metallic pieces on their shoes, well Helmut Lang did it back to 2004 and it looks so amazing compared to other mettalish shoes collections of this season. Not a fan of patent leather, except the form is slipper, maybe? 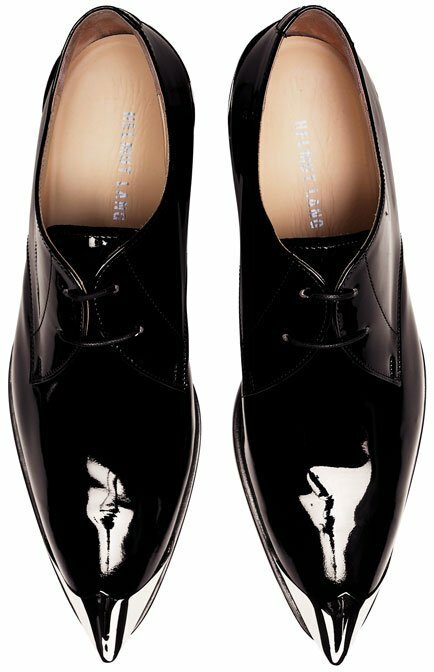 But it's 2004 and still look so good, I mean by good is up to date, not referring to timeless because it's patent leather, but this is one of the best and like no other black patent dress shirt. We need more dress shirt in unique way like this. I'm a new blogger talking about men's fashion. I was wondering if you could have a look at my blog and give me some advice? I would really appreciate. That would be great, thanks a lot in advance :).